To find out, we asked exhibit marketers to tell us, as part of the survey Tradeshow Week did for our joint white paper, The Evolving Role Of Exhibit Marketers). Exhibit marketers want to do better, but can’t. They have new ideas and a more complete understanding of the entire trade show marketing process, but can’t always get their senior management to loosen the reins and let them experiment and innovate. “The amount of time it really takes to pull something together and the critical need to incorporate marketing strategy around the event - not just rely on the exhibit to do the work. What do you want your boss to know about trade shows? If it’s in this article, maybe you could take your boss out to lunch, and offer this article for dessert. 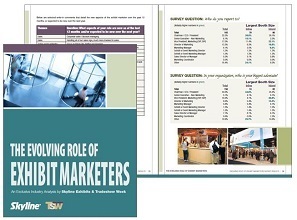 Learn how your job compares to your peers in The Evolving Role Of Exhibit Marketers, a 36-page white paper. Fill out the form now to request your free copy.